When going on any protest, it is important for you to know your rights. This is so you can prepare yourself, and also act in solidarity with other people. The police are institutionally racist, and as a result, often people of colour are treated differently on demonstrations than white people. 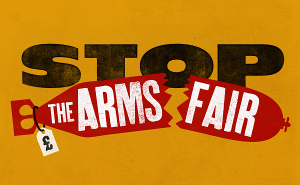 Be aware of this when you are protesting against the arms fair. This page runs through Green and Black Cross‘ key advice while going out on a demonstration. We also have a ‘Mic check’ of this information to be read out at each day of action. You can find the mic check here. This is for your own protection and for the protection of others. This applies on demonstrations, during Stop and Search procedures and during arrest. This includes your visa status. The police will try to pressure and deceive you into incriminating yourself and other people. Instead of trying to decide when it seems ‘safe’ to answer, just say “No comment” to all questions – out on a demo, during ‘informal chats’, in the police van and especially in interview. If arrested, and your friend in the next cell knows you aren’t going to talk, they will feel better able not to talk themselves. Remember, interviews only help the police – they will not interview you if they already have enough evidence to charge you. A good solicitor will sometimes suggest that you make a prepared statement in interview. In that case, you or your solicitor will read the statement and you should answer “No comment” to any more questions. For a longer discussion, the booklet “NO COMMENT” produced by the Legal Defence and Monitoring Group is excellent. You do not have to give personal details under ANY stop and search power, so don’t. On protests, the police often use searches as a way of finding out who is present, both for intelligence purposes and to intimidate you. Police also use arrest as a means of gathering information, particularly when they arrest a large number of people together (a “mass arrest”). You do NOT have to give your personal details to the police at any point during the arrest process. In fact, you are not legally required to give any personal information until you appear in court. Some police officers rely on you not knowing the law. If you are asked to do something by a police officer, ask them what power (i.e. what law) they are using and why they are using it. Make a note of what was said, by whom (numbers) as soon as possible afterwards. Don’t let them turn this into a situation where they ask you questions though – just walk away once you have your answer, and remember: No Comment! The “duty solicitor” is the solicitor who is present at the police station. They may come from any firm of solicitors, which means they almost certainly know nothing about protest. Duty solicitors often give bad advice to protesters; we recommend you always use a good solicitor who knows about protest. Offering you a caution is a way the police may ask you to admit guilt for an offence without having to charge you. It is an easy win for the police, as they don’t have to provide any evidence or convince a court of your guilt. At the very least, you should never accept a caution without taking advice from a good solicitor. You can find more detailed explanations of this advice on the Green and Black Cross website.